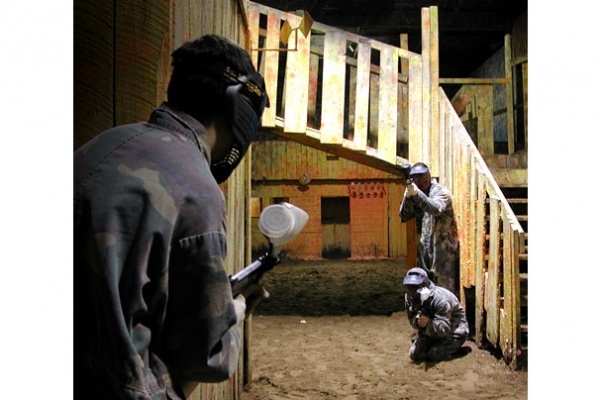 Come and live an unforgettable experience on Arnold's interior paintball field. You will play in an Old Far West village that we have built. A multitude of 2 floor buildings, bridges, a mountain and caverns make our site one of the most intriguing in North America. A surface of more than 30,000 sq/ft. Plan your strategy to capture your adversary’s flag, negotiate of the different difficulties that you will find in front of you, and beware of your adversaries that will be determined to capture your flag.The activity lasts for hours. Reservations are necessary. Come and live an unforgettable experience, a fun filled day. A strategic game in which you must capture your adversary’s flag, but beware of different difficulties which you will find, but mostly beware of your adversaries who are trying to capture your flag. Try our fourteen different fields, attack the fort, cross the river, and crawl through the bushes to surprise your adversary. The activity lasts all day. A meal is included. Reservations are necessary. The price below includes the gun, the mask, the overall, one hundred 100 balls and a meal for the outdoor paintball. Extra balls can be purchased on location at 13$ for 100 balls. • 10 and 11 year olds must be accompanied by a parent/adult. • 12 to 15 year olds must present a signed permission from a parent. Indoor: 8132, Jean-Brillon, Montréal, Lasalle. Outdoor: 474 Chemin Covey Hill, Havelock (Quebec)near Hemmingford, 15 minutes from Parc Safari.